Lilly is a registered Therapy Dog that belongs to our hygienist, Robyn. 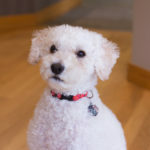 Lilly has undergone extensive training to help with anxious feelings and general uneasiness in the dental environment. She is a very soft, fluffy non-shedding hypoallergenic poodle that barks to say hello, and is very excited to come to “work“ each day. She is happy to sit on your lap and be petted as your teeth are cleaned to help calm nerves, and if time allows is a great show-off and delights in performing her tricks.